Vine Street is a full service architecture firm in NYC, catering primarily to the development community. Depending on client and project requirements, we offer tailored services and provide fast and integrated solutions to all project types. From Zoning Analysis through the city agencies’ approval process to the completed construction project, we strive to transcend conventional industry antagonisms between economy and quality to preserve the integrity of both an architectural vision and a targeted return on investment. Our tailored services provide clients with an integrated approach to all project types. We can support the process from early stages of site discovery through construction completion. Our services include zoning analysis, architectural and interior design services, as well as branding and marketing support. Pre-Acquisition services include site and existing building documentation as well as feasibility studies, detailed zoning analyses and compliance research. Based on AIA guidelines, our Architectural Services are adapted to New York City requirements. We also offer interior design and product specification services. We can help create an identity for your architectural projects. This includes logo, brochure and project book design, or simply the layout of single page project flyers. We perform basic feasibility studies as well as detailed zoning analyses to illustrate permitted and/ or required regulations, including use, yard, FAR and bulk regulations, and open space, building height, envelope, and egress requirements for a particular project and its respective zoning lot. All research is based on the New York City Zoning resolution, applicable codes and public information and our findings are presented in tabular form as well as 2D and 3D diagrams. 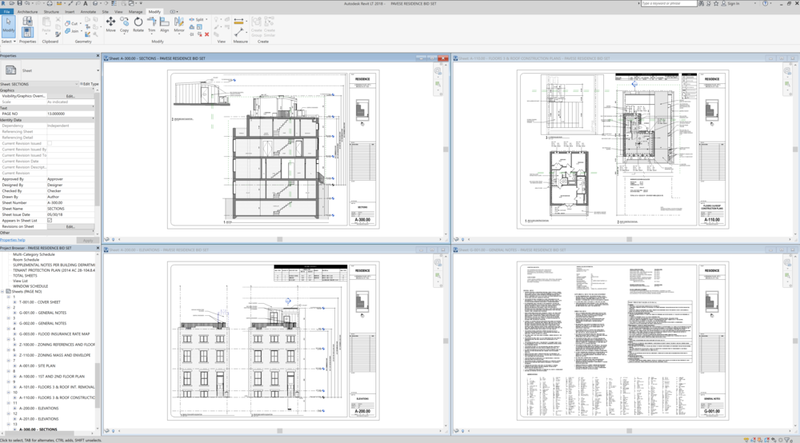 The documentation of existing buildings includes the identification of the current shell and structure as well as the documentation of interior layouts. Depending on the project scope and requirements, we document window/ door sizes and locations to identify existing light and air as well as current egress paths. We locate utilities, plumbing, mechanical runs, current accessibility standards, and if applicable, the surrounding site context. The final deliverable is a package of 2D and 3D drawings including current use and area calculations that can be used as the basis of design. Establish and evaluate program adjacencies and distribution scenarios and refine Client’s design intent. Evaluate appropriateness and feasibility of primary building systems. Generate schematic plan backgrounds, elevations, and 3D massing models as required to confirm design intent. Identify materials & methods of core & shell construction as well as interior specifications. Transform the schematic model into a feasible building structure meeting legal requirements for egress and access compliance. Coordinate efforts of the full design team, including MEP and Structural. Refine floor plans, elevations and 3D massing models as required to communicate design intent. Servicing as Architect of Record (AOR) at the NYC DOB. Formatting, stamping and submitting drawings to governing agencies across the municipal spectrum as required. Manage and coordinate efforts of the full design team to receive approvals of all required drawing sets. Support Expediter’s efforts with rapid drawing revisions, memos, paperwork and face-to-face meetings with City officials as required. Generate and collect all architectural drawings and specifications necessary to construct the project according to the legal parameters set forth in the permit set and the design intent established in prior phases. Manage and coordinate the efforts of the full design team. Review and coordinate drawings and specifications with candidate construction teams as required. Prepare bid package on behalf of Client. Assist Client to receive, review and level bids. Assist Client in development of Project Budget and negotiations with trade contractors. Answer RFI’s and scope questions. Meet with trade contractors as required to confirm scope & pricing. Assist Client with preparation of trade contracts as required. Perform regular site inspections to observe if work is proceeding according to the Construction Documents. Perform inspections on behalf of Client to verify completed work for contractor requisition review & approval. Review submittals and RFI’s as directed by the Construction Team. Review change orders, construction change directives and any deviations from the Construction Documents as required. Generate field sketches (SK’s) and track all changes to the CD’s. Assist and support Client, Contractor and Expediter in efforts to acquire a CO or a Letter of Completion. Perform final inspection(s) in effort to receive final sign-off from municipal agencies as required. Special Inspections are required by the DOB and conducted during the construction process to verify that work is being done in accordance to approved plans and specifications. We provide class 3 type special inspections to streamline the construction process on interior renovation projects. We work with clients to develop an interiors package in accordance with their desired aesthetic direction. Our typical interior services include specifications for permanently installed fixtures, appliances and finishes, the design and preparation of millwork packages for interior doors and hardware, kitchen cabinets, bathroom details and general woodwork and cabinetry as required. We provide lighting specifications and electrical/ switching plans and coordinate AV and security sub contractors. And we also prepare FF&E (Furniture, Furnishings and Equipment) packages including custom designed furniture, to assist the client in achieving the overall desired interior environment. Through interior and exterior 3d renderings, we can accurately depict materials and finishes, as well as virtually furnish each project to illustrate the design intent and future experience of a project. Our clients are able to evaluate the design options and make aesthetic decisions before commencement of constructions. In addition to providing a valuable asset to developers as a marketing tool, renderings also allow contractors to have a full understanding of the final product, therefore minimizing the possibilities for scope gaps and change orders. Based on scope and requirements, we offer branding services to assist our clients in creating an identity for their architectural projects. This includes logo, brochure and project book design, or simply the layout of single page project flyers for marketing purposes. We use stylized, diagrammatic floor plans and other 2d drawings, 3d renderings and professionally photographed images of the project to create the branding and marketing materials.